If you travel from Westport in the west of Ireland through Newport and Mulrany to Achill Sound today, here and there you will see the overgrown sections of railway embankment, bridges and a couple of tunnels, as well as the magnificent stone viaduct across the river in Newport. These are the surviving remnants of the old Achill line – a branch line built at the close of the 19th century to help develop the area and link it with the outside world. The promoters of the line had high hopes for its future, and the railway was open to the public in several sections in 1894/95. It proved to be a great social and economic asset to this area of County Mayo, but traffic never consistently reached the levels originally anticipated and as a result the line was not profitable for much of the year. 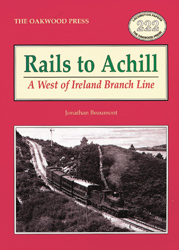 Development of road traffic in the 1930s sealed the fate of the rails to Achill and the last train ran in the autumn of 1937, a mere 42 years after the line had opened. Since then, trains have operated from Dublin just as far as Westport, which is now the railhead for the area. The track onwards to Achill was dismantled in 1938. Today the remaining stone and earthworks, along with the old railway station buildings at Newport, Mulrany and Achill Sound stand in mute testimony to the line, the local businessmen who promoted it, the builders, and the people who used it. The course of the line is still very identifiable for most of its length, despite over 60 years having elapsed since the last train ran. Here and there parts of it have a new use: the viaduct in Newport is a beautifully restored prominent local landmark with a path along the top, giving the visitor a glimpse of the spectacular views that were posisble from the train; Newport goods shed is now a small chapel; and Achill Station has become a guesthouse. This is the story of the ‘Achill Railway’, described by travellers at the turn of the 20th century as ‘one of the most scenic railway journeys in these islands’. A5 format, 160 pages, 130 illustrations.